I hope you enjoyed our new spin on a classic look for guys: the urban fisherman. 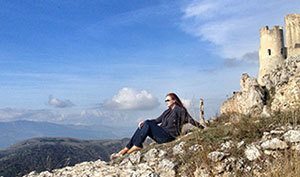 Continuing on the same theme and the coastal look for women and girls too & sharing a few of our favorite things here. 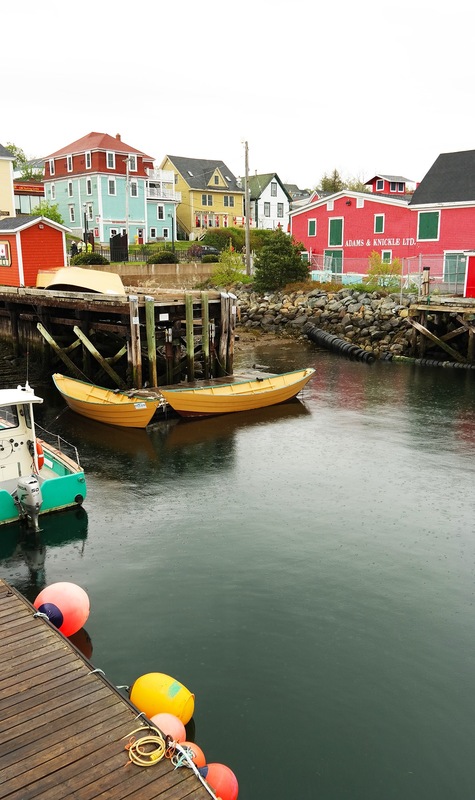 Whether you are packing for your trip to Coastal Atlantic Canada, or want the feel of the Ocean Breeze for your summer just through our photos — welcome to read more. First things first. 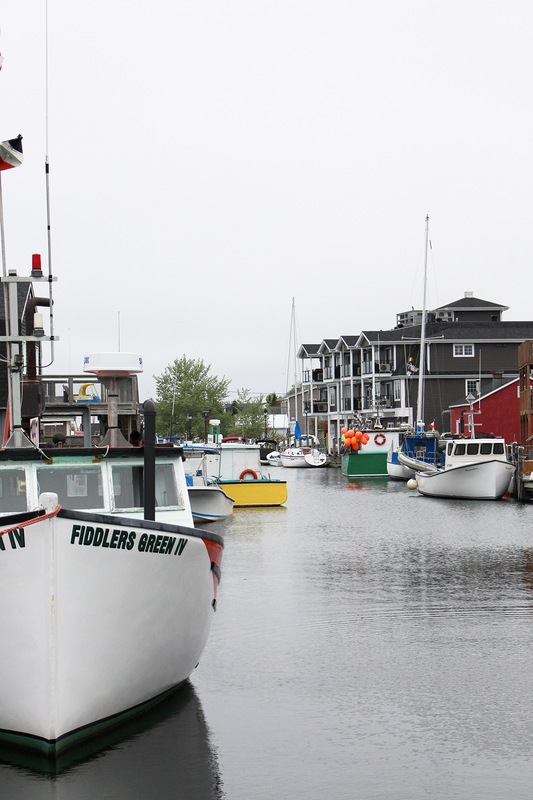 The Atlantic Canada has nice brisk weather, and you never know how breezy it is going to be, even during summer. Maybe we will get gorgeous summer weather later in July or August, we shall see, but so far the summer in Nova Scotia has been what most people could consider pretty darn cold. 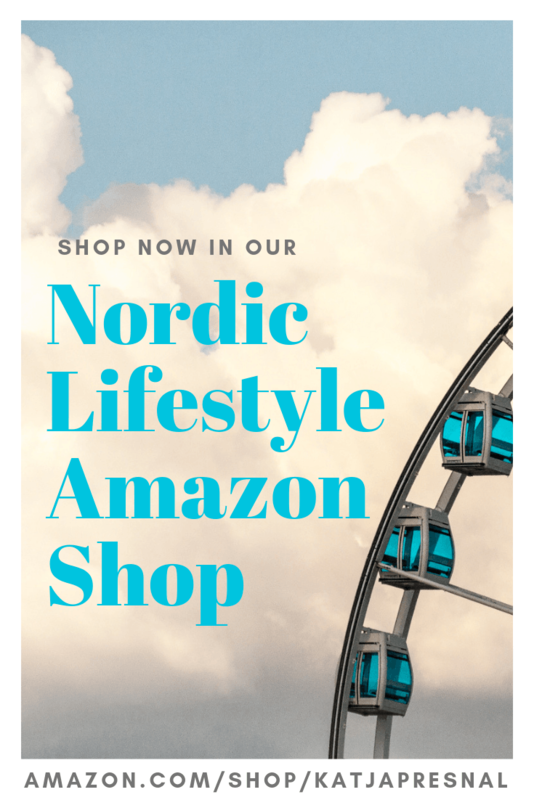 We love it, and as someone from the coast of Finland, this feels very homey and cozy to me. I love the foggy days when I can hear the fog horns on the bay. I love our neighborhood all green and lush for summer, but when I can smell people are still burning wood in their fireplaces – because it’s so cold in June. When sun shines — everyone is out and having a great time, and truly enjoying the moment. The sunshine is celebrated like a special guest, as it should. I carry my Stanley thermos filled with hot coffee where ever I go, and I’m glad I don’t have to worry about wearing shorts anytime soon. A good windbreaker, trench coat or a raincoat is also a must here. 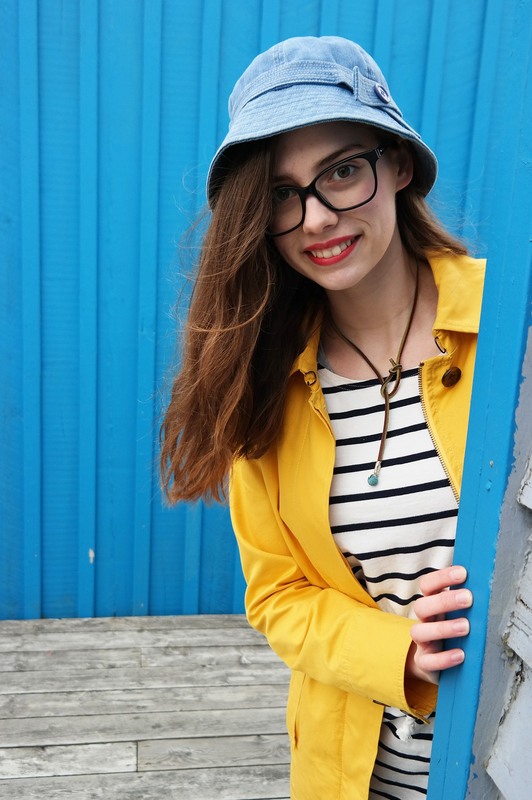 While Halifax is actually quite fashionable, it is filled with hipster, and everything pretty much goes fashion-wise. Sadly socks and Birkenstocks are a combo I see way too often, but we gladly support the “Converse with anything”-look that seems pretty fitting here. Weekends here tend to go too fast. 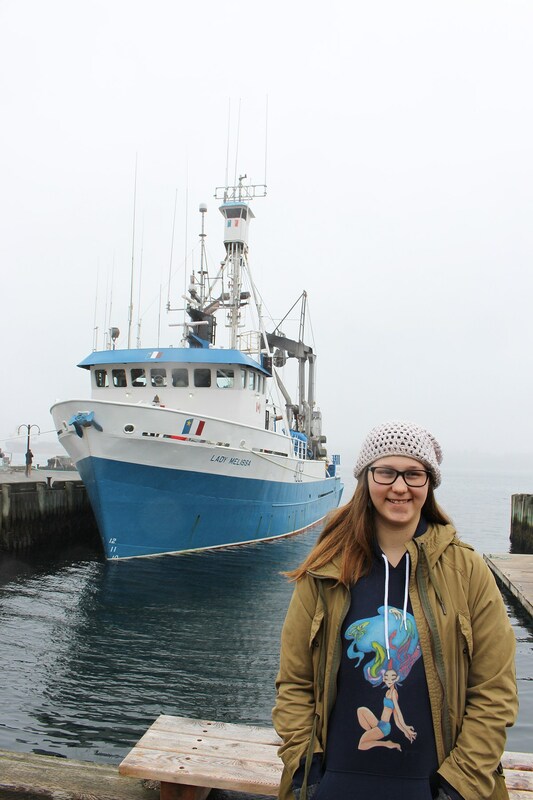 On Saturday mornings we hit either the Halifax Seaport Farmers’ Market or Julien’s Patisserie, Bakery & Cafe for fresh croissants and bread before adventuring to close by fishing villages, or attending local events, like the Greek Festival last weekend. Local events and the serenity of the sea create a balance we love. Often we mix them both, so you need to dress accordingly! The black spruce is grown in Northern Canada in British Columbia and gives nice woodsy fresh scent that appeals to both men and women. It smells like fresh powerful forest on a rainy day! Lime gives nice sweeter freshness and is one of the “happy oils” affecting your mood immediately. 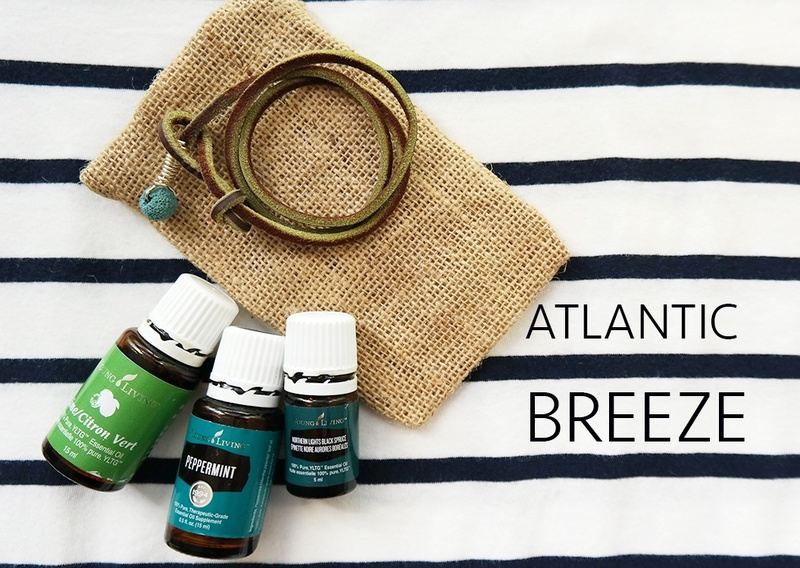 Top it with Peppermint for freshness and feel refreshed and energized with this awesome diffuser blend. Add it in your home diffuser, or in your diffuser jewelry. The Wear Your Courage leather wrap turns into a diffuser bracelet or a lariat diffuser necklace and it’s great for everyday use. 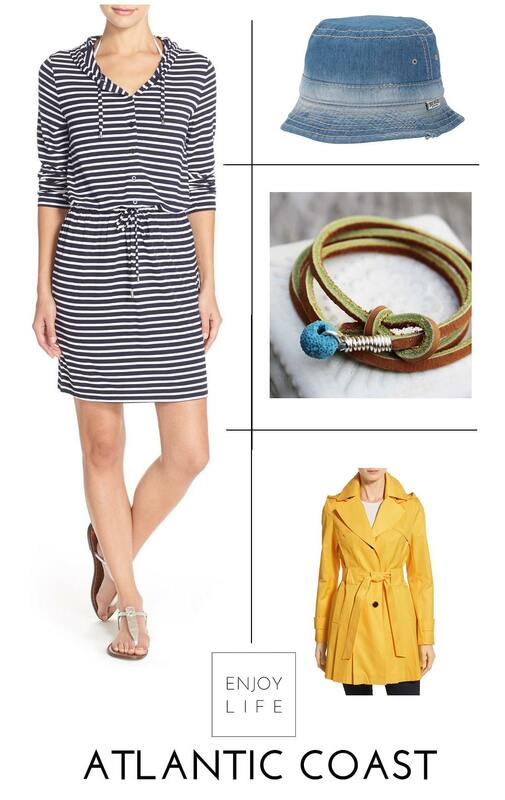 MOTT 50 Stripe Tunic Dress (UPF 50) – you can always be optimistic that you can wear the cover-up with a swimsuit too. But get one that goes well with jeans too to get your max use out in the Atlantic Canadian coast. True Religion Brand Jeans Reversible Denim Bucket Hat – it’s classic and trendy at the same time. Goes from fishing trips to the city and protects you from the sun or keeps you noggin warm in the breeze. 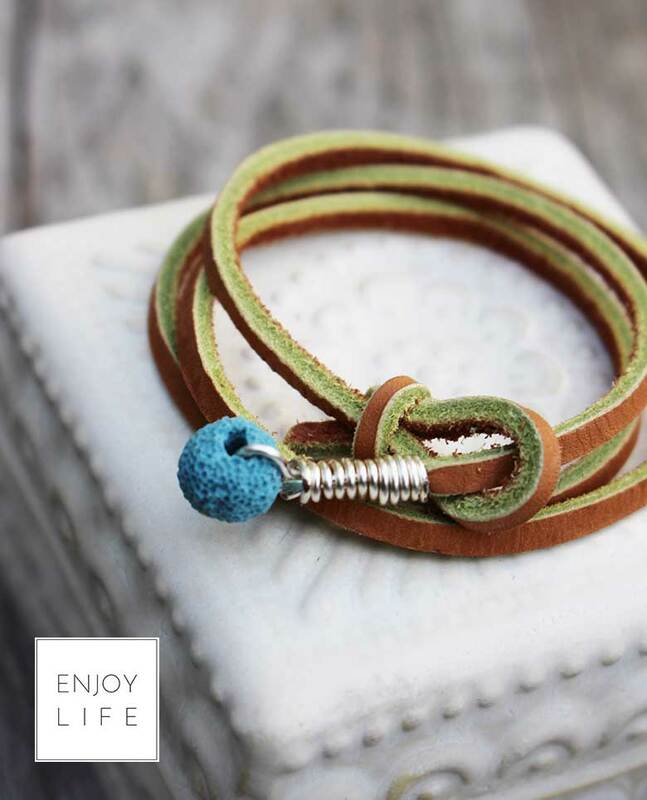 Leather diffuser necklace/bracelet – so you can wear your favorite essential oils on the go. Exclusive design for Skimbaco Lifestyle, handmade in the USA. 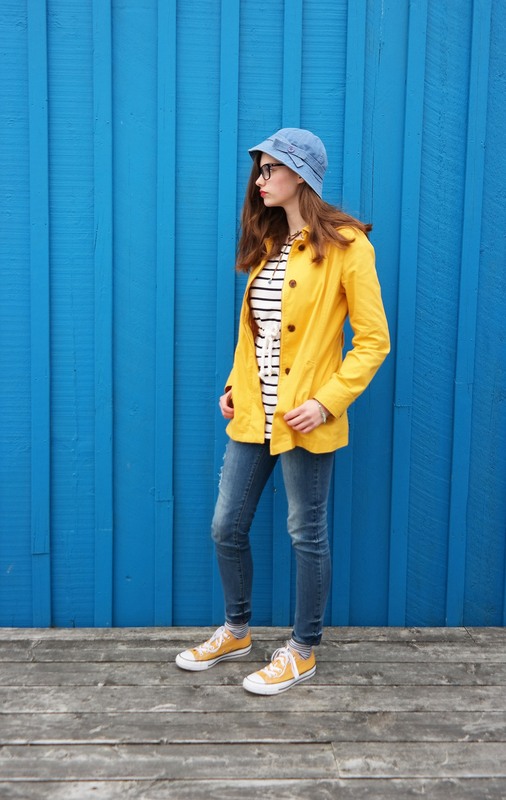 Via Spiga hooded yellow trench coat – if the yellow raincoat is just too “fisherman” for you and you want to look more city chic. 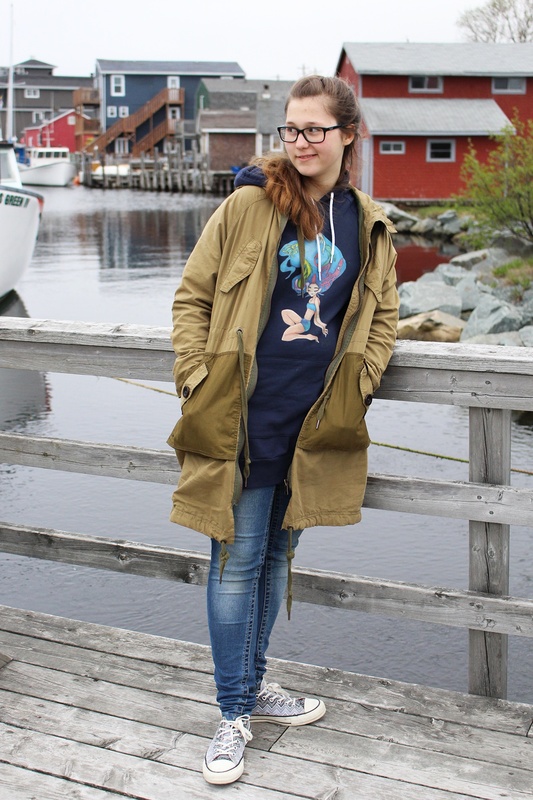 Aquagirl Hoodie Dress by Gabypie – original art designed by our Gaby, a teenager artist. 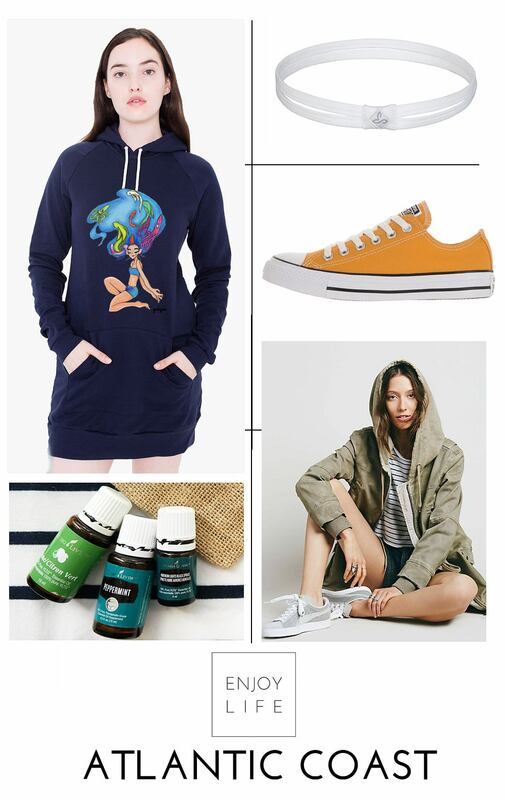 This hoodie dress is made by American Apparel and made in the USA. prAna headband – if hats are not your thing, this headband keeps your hair off your face in the ocean breeze. Slid Knit Mixed Cargo Jacket by Free People – solid choice for a anorak that goes from Canadian wilderness adventures to the streets of Halifax. 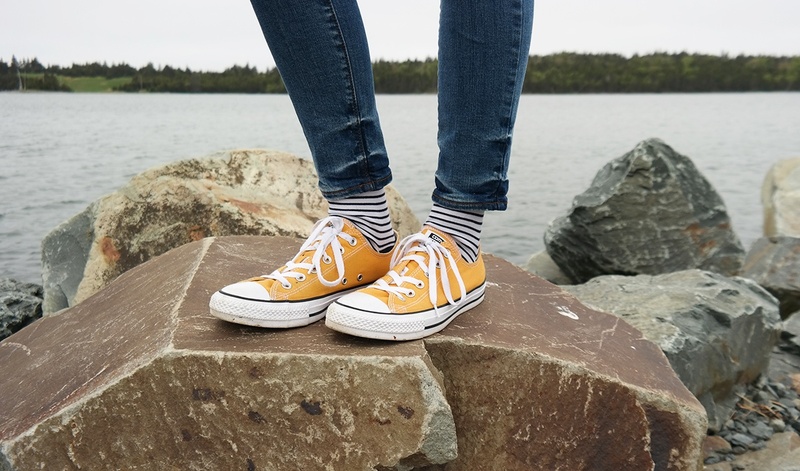 Yellow Converse – or pick your own color. Iconic multi-use shoes that give your outfit the nice pop of sunshine even on foggy days. These photos are stunning!!! and the fashion rocks! 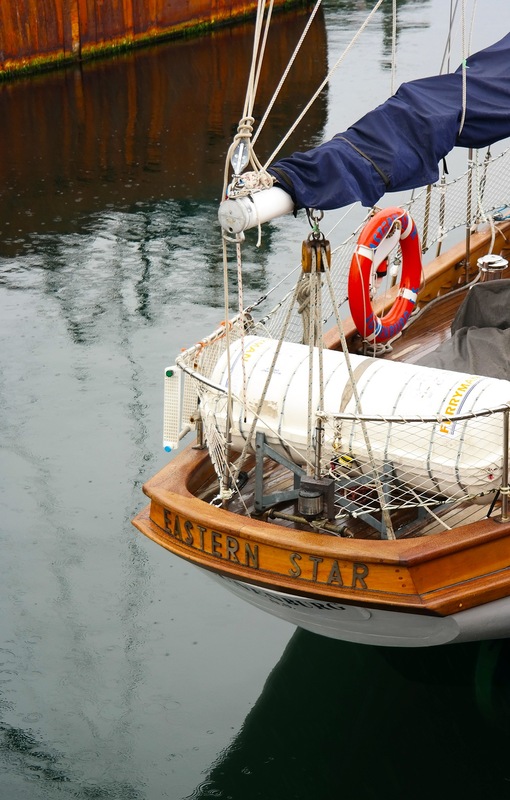 You were in my neighbourhood (Eastern Passage). 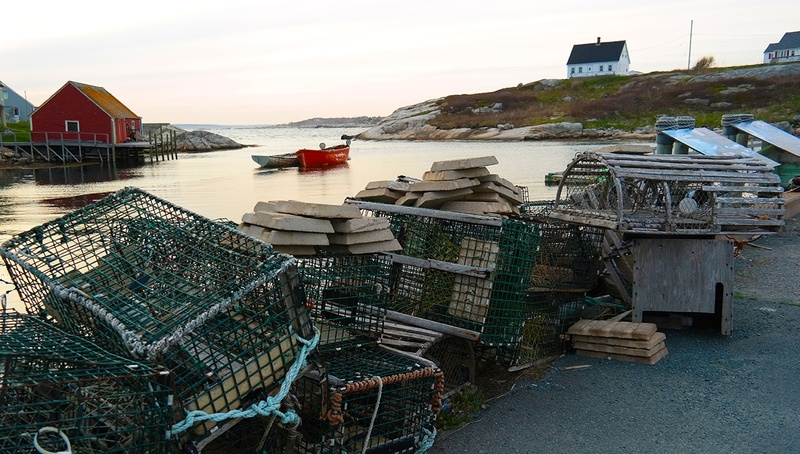 Such a charming little village at Fisherman’s Cove. Adore the yellow Converse! My husband and I have been talking a lot about a trip to Canada (to go on a fishing trip). Your style looks so perfect! The colors are just so pretty! Reminds me of Gloucester, MA! I love your family’s style and your photos. 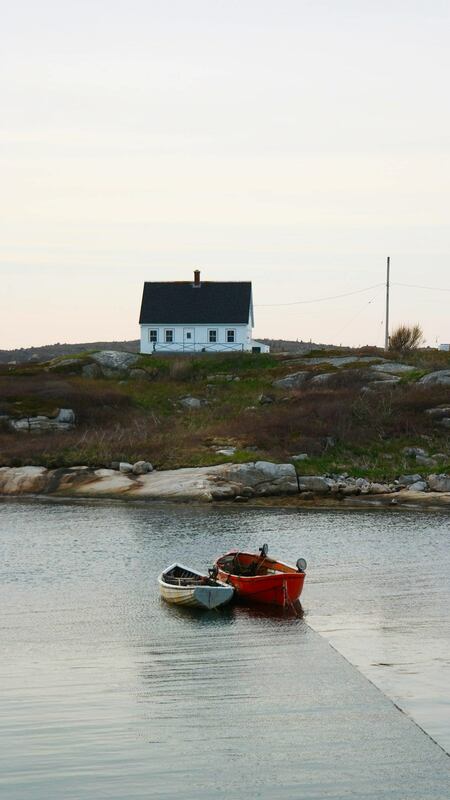 Halifax is so gorgeous (I am going to have to plan a trip back with my kids this time — we were there in 2009). I’m eying that Via Spiga yellow trench for myself. I love this foggy/rainy/brisk summer too :) At least we’ve gotten a few nice days. This is really the perfect weather for me!